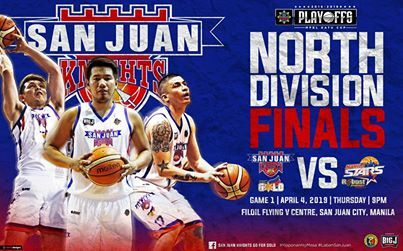 Here are the details for San Juan Knights-Go For Gold and Manila Stars-Robust Energy Drink in Game 1 of their best-of-three north division finals series in the 2018-19 MPBL Datu Cup. The Manila Stars took a 1-0 series lead in the North Division finals after defeating the San Juan Knights 91-88 in Game 1. Aris Dionisio had 18 points, 11 rebounds and seven assists to lead the Stars. Reil Cervantes contributed 16 points and seven rebounds, while Mark Lopez added 14 points. John Wilson scored 19 points and eight rebounds and six assists for the Knights.